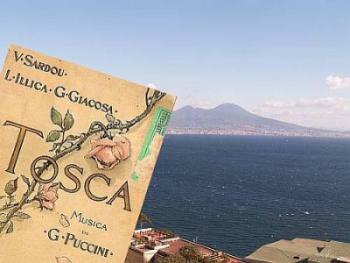 Giacomo Puccini’s opera, Tosca, premiered in Rome on January 14, 1900. It was based on the novel, La Tosca, by French dramatist Victorien Sardou (1831-1908). 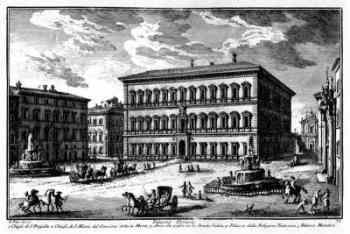 The plot of the novel and opera revolve around the beautiful and jealous opera singer, Tosca, and her lover in an episode that takes place in Rome on precisely June 17 & 18, 1800, that is, during the tumultuous days of Republican France, Bonaparte’s rise to power and his struggle with the Papacy over the so-called “temporal power” of the Roman Catholic church, manifested in the large Vatican States, of which the Pontiff was the “Pope-King.” If you want to know more about Tosca, get out and go to the opera. We note only that in various places in the libretto, a “queen” is mentioned, most famously in Act II, where Tosca is told that by the time she seeks a pardon from the queen for her beloved Cavaradossi, he will be a corpse. —In February of 1798, forces of the French Republic enter Rome and proclaim the Roman Republic. This is in line with the French Republic’s setting up of client states, “sister” republics, in the territory under French control, including the Neapolitan (aka “Parthenopean”) Republic in January of 1799. The French demand that Pope Pius VI renounce his temporal authority; that is, that he abdicate as king of the Vatican States. He refuses. He is arrested and removed to Valence in south-eastern France. He dies in captivity in August of 1799. —There is an immediate attempt by the Kingdom of Naples to overthrow the Roman Republic in 1798. It fails miserably. Shortly thereafter, the republic in Naples is proclaimed and King Ferdinand and Queen Caroline flee to Sicily. —While Napoleon is off in Egypt, Austrian-Russian forces cross into northern Italy; between April and August of 1799 they defeat and dissolve various republics previously set up by the French. At the same time, Bourbon royalists under Cardinal Ruffo come back, overthrow the republic in Naples in June of 1799 and reinstall Ferdinand and Caroline. —The exiled Pope Pius VI then dies in August of 1799. Now you have the still extant Roman Republic surrounded by crumbled or crumbling “sister” republics. The Roman Republic teeters and finally falls in September of 1799 when Neapolitan forces occupy Rome. Thus, the republics are gone and the pope/king can return to Rome to reclaim his temporal throne. But there is no pope; he died, remember? —Queen Caroline to the rescue. She appoints herself “regent” (for the absent Pope) of Rome, and rules from September 1799 to July 1800, when the new pope (Pius VII, elected in Venice a few months earlier) reenters the Eternal City. —But before that, in June 1800, Napoleon (who has really just been warming up all this time) crosses the Alps and invades Italy again, winning a major battle at Marengo on June 14. The battle is see-saw for a while and the events in Tosca revolve around a celebration in honor of Napoleon’s anticipated defeat, a celebration at which Tosca is to sing. That never happens, of course. News trickles in of Bonaparte’s victory at Marengo. Tosca, herself, then…well, go see the opera. Of 8,000 political prisoners 105 were condemned to death, six of whom were reprieved, 222 were condemned to life imprisonment, 322 to shorter terms, 288 to deportation, and 67 to exile, from which many returned: a total of 1,004. The others were set at liberty. The author has a Bourbon axe to grind in his book, yes, but he is a reliable historian, and it is not likely that he simply made up those numbers. Thus, I suspect that there were certainly some anti-Republican reprisals in Rome and that Maria Carolina was responsible for them. Beyond that, I don't know.